It started 20 years ago with a vision to leverage technology to improve access to care and efficiency. But instead of the iPhones and FitBits that are driving care today, it was a camera the size of a shoebox that offered game-changing potential. Today, Partners HealthCare Connected Health continues to push the envelope by transforming healthcare through tools like remote monitoring and virtual care. In this interview, Joe Kvedar, MD, talks about how the organization has evolved to meet the changing needs of patients and providers, why telemedicine is finally rising to the top, and the problem with statistics around patient engagement. He also discusses what encourages him most as a physician, and how CIOs can navigate this brave new world. If we just happily celebrate the digital health newbies and fitness buffs and whatnot, there’s nothing wrong with that, but we’re not really getting at the heart of our cost problem and the real opportunity, which is to help people manage multiple chronic illnesses with these tools. We’re reminding people that they’re sick. This whole set of technology is reminding them they’re sick. It’s also reminding them that they have some opportunity for accountability. Some people find that scary. Facetime and Skype changed how people thought about video because you it wasn’t about patients; it was about your loved ones. You can Facetime with your kids or your grandmother or whoever. As we as a society got used to that and that became something we just did, all of a sudden clinicians could start to see it. It’s really thinking about how to secure your network beyond your four walls, and how to have a data integrity strategy that allows you to have conversations with patients and clinicians who want to participate in this space, whether it be by video or by secure texting or by exchange of device data or by using a mobile app. Gamble: It’s interesting; it’s been 10 years since the iPhone was introduced, and the amount of change we’ve seen in that time has been absolutely staggering. Gamble: For physicians dealing with patients of different ages and different preferences, I can imagine that it must be so challenging because not everybody is onboard with this or really wants to engage that way. Is that something we’re going to continue to grapple with? Kvedar: Absolutely. I’m glad you brought it up because it seems like every market research firm publishes numbers that are optimistic about digital health adoption. And I don’t mean to say they’re wrong, but they typically look at a segment of the population that is enthusiastic adopters of these tools. Right now, you really see the market for digital health on the patient side as being people who are engaged and interested, whether it be fitness buffs, quantified selfers, and those people who have an illness and are motivated and determined on their own to do something about it. That’s what’s driving all the interest in everything from Withings to Fitbit to all of these other tools. What we deal with as healthcare providers every day is we don’t get to choose just those people. We have another very important population of people who are either too sick or they’re checked out or they don’t want anything to do with digital or they’re afraid their data’s going to get stolen. Designing products, programs, and interventions that bring those people onboard is critical, because they are the 5 percent of the people that drive 40 percent of healthcare costs. That’s them. If we just happily celebrate the digital health newbies and fitness buffs and whatnot, there’s nothing wrong with that, but we’re not really getting at the heart of our cost problem and the real opportunity, which is to help people manage multiple chronic illnesses with these tools. Things have to be designed completely differently for that because, number one, most of them have no proclivity to get excited about quantitative information or about wearables or mobile tools. These are things that most of us who are enthusiastic put up with, like having to pair something with your Bluetooth five times, or having to download something and sign in. All of that stuff has to be made much easier for that segment to adopt. We’re working on some of those things, but we continually learn the same lessons, which is it’s different. We’re reminding people that they’re sick. This whole set of technology is reminding them they’re sick. It’s also reminding them that they have some opportunity for accountability. Some people find that scary. We just had one of our research assistants blog about a story that is very timely here about a group who enrolled in a home blood pressure monitoring trial. There was a couple — it was the husband that was the patient, and every time the blood pressure was high, they ran to the wall and unplugged the hub device so that it wouldn’t upload because they didn’t want the doctor to know that the blood pressure was high. Of course it turns out that the hub devices saves them all and transmits them when you plug it back in the wall. The point of the story was that these data are creating a new version of truth, and that’s sometimes hard. There’s a lot of psychology for managing chronic illness this way, and we have to overcome a lot of it. That’s not to say that it should all be a negative twist, but let’s not conflate the fact that kids use Snapchat and Instagram with success. In digital health, we’re not nearly there. Gamble: When you think about the consumer as that growing movement, what encourages you as someone who’s been a physician for so long? Kvedar: Several things are encouraging, I think. One is that the wearables themselves are getting better at giving you insights as opposed to just a number. The original crop was designed for engineers by engineers, and engineers are very quantitative. I happen to be a quantitative person, so I missed this. I was all excited to track everything under the sun, and then a friend of mine who is in the world of communications and marketing pointed out to me that most of the population doesn’t give a hoot about these numbers, and that’s true. You’ve got wearables coming out like Spire which tells you about stress. It tracks respiration but it doesn’t tell you respiration. It tells you about stress. And there are other examples of new tools that are helping with things like pain relief or tracking when you might have an epileptic seizure, things like that. That’s encouraging. The second is it’s becoming easier for people to integrate those into the clinical systems environment. Companies like Validic or Human API are creating easy ways to bring in those consumer devices so that we don’t have to sweat integration for every single device. A third thing I think is interesting is this movement toward real examples in our world of artificial intelligence. We talked about how Facetime and Skype changed how people thought about video because you it wasn’t about patients; it was about your loved ones. You can Facetime with your kids or your grandmother or whoever. As we as a society got used to that and that became something we just did, all of a sudden clinicians could start to see it. Many people now have the Amazon Echo in their home and they’re talking to technology and technology is doing things for them. With a new user interface, Siri, Alexa, Cortana, and Google are getting us more comfortable with this new AI-driven environment, and that’s encouraging. The last one that I’ll mention is as much as we’ve painted doctors as a group of laggards, they’re coming onboard. The AMA recently did a survey of about 1,300 of their members across multiple specialties, so a very comprehensive view. And 45 percent of them are eager to do something in the space, and 12 percent are doing something in the space. So although we’re not across the chasm to early majority yet, that’s a good sign that there’s early adopter enthusiasm for connected health and digital health that we didn’t see even two or three years ago. I’d say there’s lots of reasons to be optimistic. Gamble: Really interesting. I’m sure that when you look back at those days when you were looking for something new, I guess that you certainly found it with the connected health. Kvedar: When I started, I made a statement — we were talking about telemedicine at the time — I said, ‘If we get this right, we’ll be out of a job because it won’t be telemedicine. We don’t talk about telebanking when we go to the ATM.’ We’re still not quite there, but some of those early applications certainly are becoming a mainstream part of healthcare, and yet there’s a whole new set of interesting challenges that involve this journey that keep us fresh, and that’s part of the excitement. I’ll have plenty to do for another couple of decades, I think. Gamble: Yeah, I would think so. Before we wrap up, did you have any other thoughts on how CIOs can navigate some of the challenges of this new world? Kvedar: There are some basic things that they will already be paying attention to that resonate here — things like security and privacy, and the reason for that is if a CIO has gone through a BYOD-type journey, they’ll be more comfortable with this new world because it involves patients linking into things. How do you support a patient who can’t make a video connection? And it involves patients wanting to upload device data. How do you know if the device is accurate? You’re going to be blamed for someone hacking into their device. If a patient starts uploading data to the portal, are you exposing a channel where their stuff can leak back out and you’ll get blamed for that? So it’s really thinking about how to secure your network beyond your four walls, and how to have a data integrity strategy that allows you to have conversations with patients and clinicians who want to participate in this space, whether it be by video or by secure texting or by exchange of device data or by using a mobile app, what have you. I think that’s pretty important. 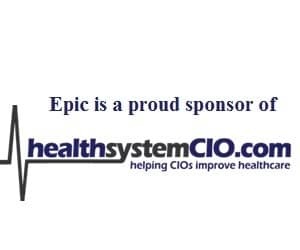 These days, I would say every health system CIO should at least be familiar with the market options around virtual care and the brand names out there: American Well, TelaDoc, MDLive, etc. They should be at least vaguely familiar with what they’re doing because if they’re not already in that space, there will be a time in the near future when they will be in that space, and they should be prepared to think through the IT implications of bringing a vendor onboard to manage a virtual care implementation. That’s sure to happen everywhere within the next few years, I would say. I thought those are two important things to bring up. Gamble: It’s a really good point. Even for organizations that are smaller or are especially strapped in terms of budget, whether it’s partnering with other organizations or anything else that could happen as far as acquisitions, it’s really wise to just know this market and be familiar with it and be ready. Kvedar: Yes. If someone like your Chief Medical Officer or your CEO walks in and says, ‘What should we be doing about X,’ you can either know the space, or look at them like a deer in the headlights — and you don’t want the latter. Gamble: Right. Well, I really appreciate this. I know you have so much going on, so thanks for the time. I think this is going to be really useful for our readers and listeners. Kvedar: Great, I’m delighted to talk to you. Have a good day. Gamble: Thank you, you too.